I really haven't been around much on the blogs this week. It's been a little crazy around here. We bought our new fridge and it is wonderful. I had to get a different type than we had before. While they still make the ones with the regular fridge on top and the freezer on bottom, they no longer make them as wide or as tall or as deep. So I couldn't just get an almost identical replacement, which was what I wanted. We ended up getting one with a freezer on the bottom and a fridge with French doors on top. The freezer is really nice. When you pull open the door the bottom bin comes out and the top bin stays in the freezer. If you want the top bin then you pull it out over the bottom bin. I will keep things like ice cream in the top bin so that if I am looking around in the bottom bin for a bit, everything in the top bin will stay cold. I have the top bin pulled out partially for the photo. The top has three individually temperature controlled drawers. The bottom one stretches the whole width of the fridge and is shallow and it is for things like deli meat and cheeses. And then the other two drawers are for fruits and veggies. I love that I can set the veggie drawer to a higher humidity than the fruit drawer. It also has a shelf that lifts and stacks on itself so you can put a taller item in (the blue pitcher in this case) without having to move or take out a shelf to accommodate it. It is a deeper fridge than the one we had before. It has 26 cubic feet of space. It uses LED lighting and when you open the French doors (or at least when I do) I feel like the angels are singing Hallelujah! It does light up like the heavenly host, LOL. It has an ice maker and an interior place for filtered water. None of that is hooked up. We won't hook it up while we are living here, but will when we move to our farm. I really, really love this fridge. It was a bit more than I wanted to pay, but the low end models just were not big enough. We need something that can hold a lot of produce when we are processing during the garden months and during canning season. It has a digital read out of the temps in both the fridge and freezer so I don't have to guess or try to find a thermometer to put in there if I suspect something is going wrong like we did with the last fridge. That is a very nice feature to have. We ended up getting one that cost $1595. I had been aiming for $1200. We got the $149 five year service agreement. That covers as many calls as we might need and if we never use it will be credited back to us for a future purchase at that store if we spend over $799. Since we have bought things over that price range 3 times now from this store in the last 15 years, I figure it will be used one way or the other. 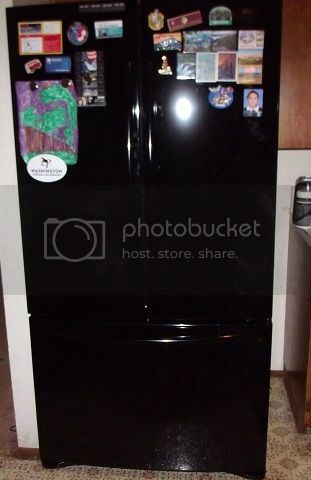 We also paid for delivery and to have the old fridge hauled away and recycled. With tax it all came to close to $2000. I used $700 from the Appliance Fund, $400 from the Vacation Fund, and the rest came from the Christmas Bonus. It was nice to be able to pay for it with cash (which did get us a small discount). And we bought from a local business instead of a box store, so I feel good about that. We bought it Friday and they delivered it on Saturday. Excellent customer service. One of the guys who delivered it was one of the guys who delivered our bed a couple years ago. I love small businesses with low turnover. After using this fridge for a day, I love it just as much as I thought I would. It was a good purchase that I don't feel bad about at all. 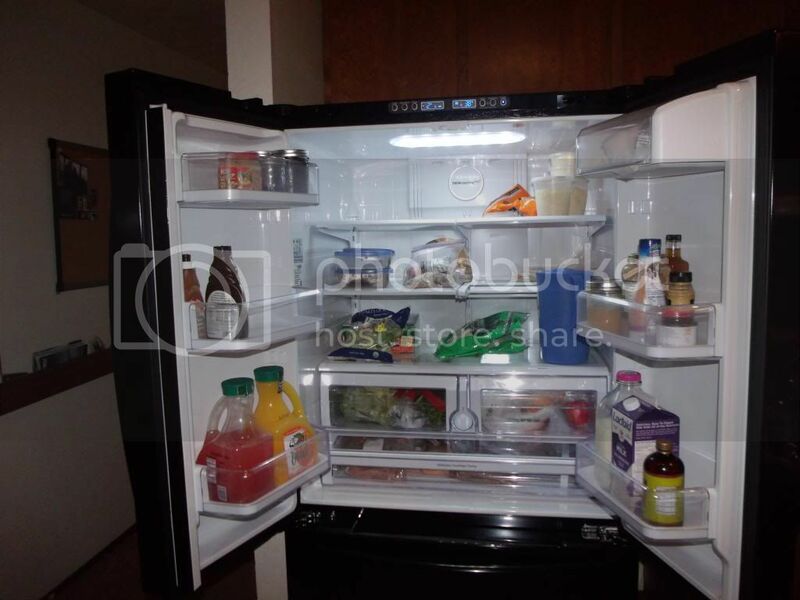 I would have felt bad settling for a fridge that had less than what I wanted. I also would have felt bad if we'd gone for one of the $2500 or $3000 fridges. But this one was just right. It looks lovely. I'm sure you will enjoy having it, especially with all the cooking, preserving etc. that you do. Enjoy! Love your fridge and freezer. Mine shares a number of features w/yours, like freezer on bottom and only the bottom drawer pulls out. I hope my fridge really lasts because I have some of the same size issues; my fridge slot is standard but narrow, so I spent a lot of quality time with the tape measure. Everything seemed to be 36 inches wide and my slot was really only 33 inches. Also got the 50$ rebate for recycling my old fridge, so that would be something to try. Can I ask which brand you bought? We love Maytag, but I know a friend bought an LG. We still have our 22 cu ft from with freezer on top. Doesn't even match the kitchen or our other appliances...but it works!! 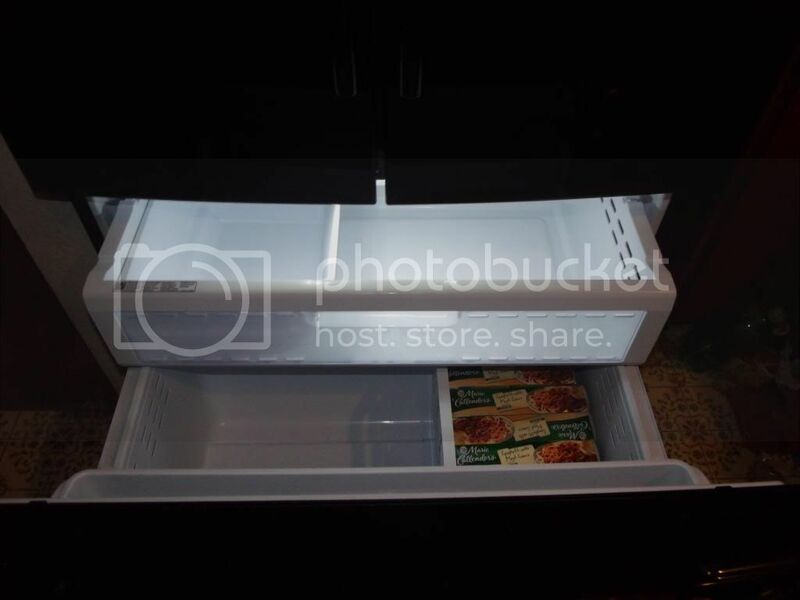 I know we will upgrade at some point and I do like those with the freezer on the bottom. Good for you for buying local! There's something magnificent about larger, cleaner, newer appliances. CCF--It is actually a Samsung. I didn't even know Samsung made refrigerators. We talked to the salesman for a long time about it and he recommended it over Whirlpool, GE, and Amana who have been in the industry forever. He says that unlike several years ago, Samsung parts are readily available here now. That was a big consideration for us. Paulette--I try to buy local as much as possible, particularly when it comes to appliances and furniture. Baselle--The rebate here for recycling the fridge is $30. With snow on the ground and the holidays on, we just didn't want to be bothered with trying to do it ourselves so they took it away and did it for us. It was a little added expense, but was worth it to not have the hassle right now. We made sure we got our measurements before we went shopping and then we used a tape measure at the store, too. I'm glad we did because they didn't quite match what it said on the tags sometimes. Thanks for the feedback, we have been seeing Samsung fridges in the stores. Seems odd, since I think of them as an electronics manufacturer. I bet it will be great! Our early 1990's (assuming so) Fridge is making some really crazy racket off and on when it is running. Our Oven, early 1990's and possibly very late 1980's (electric with exposed burners) is touch and go sometimes, especially with the front large burner; it works when it wants to, when turned on low will heat to high. When that happens it means unplugging the burner and plugging it back in to get it to work properly, plus no matter how many times we clean the drip pans and under the "hood" it smells when you turn it on. Our Microwave appears to be early 2000's and works good, however, the only black appliance, everything else if off-white! The Dishwasher, appears to be early 2000's, that also is pretty loud at times, but not all the time! So, we have been poking around and pricing them all out over the past 2 years, but no matter how we dice it, we are at $2,500-3,000 for the whole mid-level kitchen suite! Mostly the reason we haven't done so yet! We replaced our Washer and Dryer 3 years ago, when we purchased the home. We went with LG front loads and they are working great and purchased the 5 year warranty at the time.